Scaredy Squirrel- Leadership Role Model!!! Our Gr. 10 Leadership students always complete an assignment based on the fantastic book Scaredy Squirrel by Melanie Watt. Start by reading them the story elementary school style. (one time we tried showing the pages by powerpoint but reading straight from the book went way better) Be sure to give it a very dramatic reading. 🙂 Then have students get in partners. Have them first share one big leadership idea that jumped out to them from the book. Invite some students to share with the class or group what their partner’s big idea was. 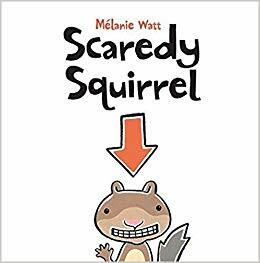 Then have the partners talk about one thing they could do in the next few days to become a better leader that they learned or were reminded of from Scaredy Squirrel.